The perfect computer drafting table for a classroom or home studio. 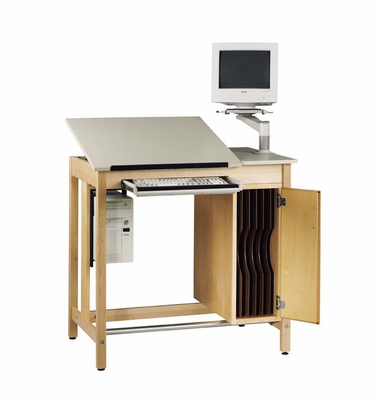 DIVERSIFIED WOODCRAFTS Drawing Table System with Board Storage This drawing table system is a smart choice for any educational setting or home studio. It is designed for use with modern computers (laptop or desktop) and for their supporting hardware. It has an adjustable arm for a monitor or laptop, a tray for a keyboard, a mouse station, a cubby for a CPU and a cable management system. The desktop surface is made of tough and durable 3/4" Fiberesin, which can be tilted into a variety of positions. It also features a rigid pencil stop to keep materials from falling off when comfortably adjusted. The table system includes six vertical slots for maintaining boards or canvases in an upright position. The table measures 12" wide on the flat side. It is 30" wide on the adjustable side.